Today we are showing YOU how to transform a song into a nightmare using some basic plugins you can find in your editor or digital audio workstation, perfect for your upcoming horror film. In our short film The Asylum Groove we wanted to emphasise a disturbing scene by slowly manipulating the music from a lovable and heartfelt song into something twisted and disturbing to give the impression our character is slowly realising he is trapped in a nightmare. We did this with some default plugins found in Adobe Audition. The plugins we used can also be found in Premiere and other editors, or even free DAWs like Audacity. So if you don’t have access to purchased products, you can still achieve this effect. The trick to making this technique work is juxtaposition, which is essentially a fancy word for something with heavy contrast. The heavy contrast for this technique is picking a song which you’d not recognise as being scary, spooky, or horror-like, which means when we manipulate it, it will amplify the juxtaposition and we will be left with something very disturbing to add to the freaky images on screen. Juxtaposition is the reason why Tiptoe Through The Tulips sounded so scary in the horror film Insidious. The nightmare scene in The Asylum Groove also includes some sound design elements to help emphasise the disturbing scenario even further. We have a video all about sound design elements and how to use them. Okay, that’s enough card dumping, let’s get started. I downloaded a song from premiumbeat called Devoted To You. It’s cheerful and positive. The first thing we want to do is play with the EQ and reduce the full-of-life sound into something small and tinny. We can do that by selecting an EQ plugin. I’m in Audition, but this will work in pretty much any editor or DAW. I’m going to usce a 10 band Graphic Equalizer; this is one of the easier EQ plugins to wrap your head around but also gives some flexibility. Right now the EQ is in a straight line. This means the frequency bands are all even. To make this song sound tinny and reduce its fidelity down to something more sinister, we want to create a ramp going up hill to the right. Reducing the bands on the left will cut the bass from the song, and increasing the bands on the right will amplify the treble, giving us a very low fidelity song which sounds like its coming from a old, cheap speaker. Sometimes when you do this, you might notice it will clip the audio. If this happens you will find a master gain fader somewhere in the plugin which you can adjust to stop it from peaking. Obviously, this is all to taste, so adjust what you think works for your film. The next thing we want to do is add some reverb into the mix. 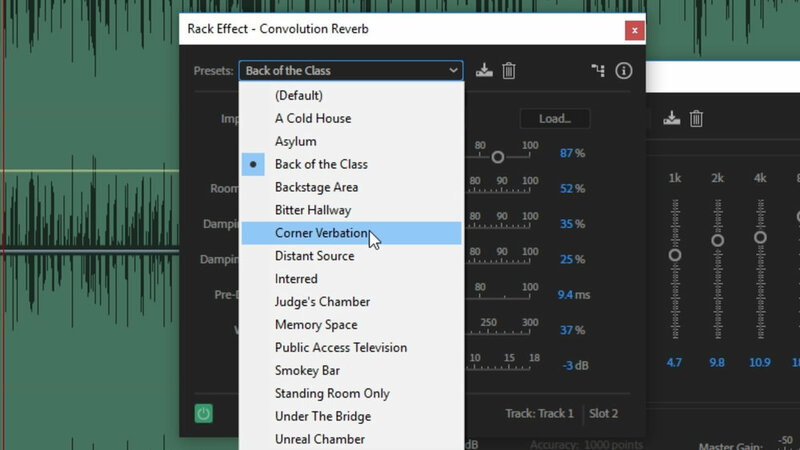 There are a ton of different reverb plugins and settings, so I would suggest picking something straight forward like convolution reverb and trying out the different presets until you find something you like. The purpose of this plugin is to give the impression that the room is bigger. More reverb basically means more space for sound to bounce around an enclosed space, so by adding reverb onto the song we are trying to make the character seem smaller in the scene by increasing the size of the room. This is psychological emphasis. Next up we have pitch shifting, which is the first plugin which REALLY gives the song a eerie and uncomfortable feeling, contributing to the nightmare effect. With this plugin, you want it to be subtle. If you go too far in either direction, you get chipmunks or a bad darth vader impression, so be sensitive with this one. With the pitch shifter, we will decrease it two semitones. This will make the song change in key and will start to sound a little weird. Coupled with a slow fade-in with this plugin, it should provide us with a really strange final effect. Next up we have echo. This is very similar to reverb, but instead of simulating a change in the size of the room, we are creating feedback which echoes more clearly. The idea behind this plugin is to generating a disturbing, paranoid voice in the back of the character’s head, as the vocals repeat over and over from the echo. Play around with the echo presets until you find something which has tight echo with a quick decay. You don’t want to pick something which lingers too long or has an extended delay. A delay plugin will give similar results. Last but not least, we have chorus and flanger. This effect is basically to create the most weird sounding, alien abduction simulating, vocally destroying sound effect. This effect will add some paranoid static to the mix and will throw the sound from right to left and back again. We can go aggressive with this one. We want to hear it slowly destroy the song. Once you have your song completely messed up and sounding really sinister, we can fade in the effects. To keep it simple, I’m just going to duplicate the track and crossfade between the clean song and the crazy-weird one. You will want to choose the best time to cross between the realms. And you might want to consider fading in each effect separately. To sell the effect even further, I added a few sound design elements along with some foley art and the dialogue in the scene. And wouldn’t you know, we have a video about foley art! 🎵 http://bit.ly/tflpb-devotedtoyou - Click here to download this episode's track. Check out Premiumbeat.com to discover a huge range of exclusive royalty free music! With every film, we’ve always learned something new and when we made our short film The Asylum Groove this was definitely true. In this video, we are going to share 24 filmmaking tips, tricks, or hacks which can help you, make your short film. 1 - Use your character's costume to help tell the audience about their backstory. For example, clothes that don’t fit shows they can't afford new clothes and may have been handed down to them. 2 - The same goes for clothes that are unironed, this shows the character does not take much pride in what they are wearing. 3 - Or it helps to show a turning point when your character has stopped caring about what they look like for whatever reason. 4 - Create a mood board from past films to help with how you would like your film to look. This will give you a direction to work towards when it comes to creating your film. 5 - It will also help others to see what you are trying to achieve. 6 - Don’t just use reference images from films, look at other pieces of art. Google Images can be your best friend. 7 - A good prop can introduce who a character is without any words of dialogue being spoken. If someone flashes a police badge we know straight away they are police. 8 - The version of a prop you use is also important. A plastic mop and bucket are a lot more modern than a wooden mop and metal bucket. A vinyl record can also help to set the film in a particular era or shows your character is a little old school. 9 - Build your story around a pre-existing location you already have access to. This will give your set a bespoke feel with a lot less work. 10 - The right crew is more important than the camera, chose that first. 11 - When casting an actor, let them read the whole script. Don’t be too precious about other people reading it; it might convince a great actor to accept the role. 12 - If your script doesn’t include many lines of dialogue, ask your auditionees to read a monologue which they think suits the role instead. 13 - Then once they have performed it, direct them to act the same monologue but with a new character motivation. If they can take the redirection now, it is a good indication that they can mold to your vision on set. 14 - If you have many different actors coming in to read for the same role, ask them to read from one particular scene. This will allow you to see many different versions of the same character. 15 - Record auditions so you can review them side by side later on. 16 - Use these DIY T-Brackets as t-marks so your actor knows where they need to hit their mark. 17 - Gaff tape the DIY T-Brackets so they can easily be seen. 18 - Don’t underestimate rehearsals. The more time you spend with your actors, the more they will understand what you require from them before the shoot day. 19 - In fact, spend time talking to your crew before the shoot so everyone is working from the same plan. 20 - Create key phrases for each character’s emotional beats throughout the script and add them to the storyboards. This will help you give quick directions when on set. 21- When you need an authentic shock from your actor, pop a balloon next to them. 22 - Use a door wedge to help level out your camera when it’s on uneven ground. 23 - Add tape your lens so you can set the focus marks you need to hit. 24 - When working with other filmmakers, find out which areas they are most passionate about, and take advantage of their skills. If you want more filmmaking tip and tricks, check out our 100 filmmaking tips in 10 minutes video here. 🚀 http://bit.ly/rs-aspect - Give your video a clean look with Aspect by RocketStock. It features over 200 logo reveals, intros, lower thirds, overlays, icons, and transitions. 🎵 http://bit.ly/track-hot-fusion - Click here to download this episode's track. Check out Premiumbeat.com to discover a huge range of exclusive royalty free music! A well-planned post-production workflow, even as a zero budget filmmaker, will save you a lot of time and prevent any hiccups during editing, sound design, VFX, and colour grading. Once you have a picture lock, it’s time to share the edit and work on sound, music, VFX, and colour grading; and for some, this can be done all at the same time by a team of collaborators. Last time, we spoke about organise and sync, first picture assembly, initial feedback, re-edits & picture lock. So now you’ve made the decision to lock the edit. You are happy with the cut, and any other edits will be strictly for emergency changes. You’ve already gauged feedback from other filmmakers, you’ve made those changes, and now it’s time to move on. This is where we can branch out. If you, alone, are the sound, VFX, music, and colour grading department, then you can follow these steps in a linear fashion. But if you are a team, it’s time to divide and conquer these tasks. First, let’s talk a bit about VFX. This is the only department which may need access to footage BEFORE the picture lock. The visual effects in the film will influence the sound design, music, and colour grading. So if it is at all possible, visual effects should be the first to get their hands on the edit. If you already know which VFX need to be added to certain shots, the visual effects department can begin working during the editing process, but please be aware that some shots might be cut. So this is a balance between getting in there early and not wasting time on shots that won’t make the final cut. Next we got sound design. With an export of the edit, the sound department can start to work on Foley Art. Foley can be a long process as it includes re-recording all the run of the mill sounds in sync with the edit, and experimenting with sound effects libraries. We’ve covered foley in a bunch of episodes in the past. There’s a card in the corner and a playlist in the description if you want to learn more. In the meantime, a colourist can be working on the colour grade. Just as sound design only needs the edit for sync points, colour grading doesn’t affect the sound in any way as it’s all visual, so these two can be easily worked on at the same time and brought together in the end. A locked-picture will give the composer the exact timing to create and tweak the music throughout the film. Having the edit in front of them while they compose will also give them inspiration in the images. There might be something in a scene which they want to harness and use as a musical device, so giving a composer the edit will let them work their magic to its full potential. Visual Effects make this process of divide and conquer a little more complicated. VFX is the only department that will cause the other departments further changes. If you are working on your own, I would suggest working on the visual effects before sound, colour grading, or music. Once the VFX have been produced, extra sound effects will be added to the sound design, gunshots and explosions and spaceships for example. The colour grade might need tweaking once the VFX have been applied also. Basically, every department will produce a another draft of their work with the final VFX in mind. Once all the departments are finished, it’s time to put everything back together. This brings us to quality control. Device testing and volume referencing are key contributors to a great looking and great sounding film. We’ve covered these topics in another video if you want to check it out. There’s a card in the corner and a link in the description. Once you feel you’ve done everything you can with the film, it’s time for one last feedback stage: the 99% feedback stage. Don’t say you are finished just yet! You might jynx it. Show the film to as many of your filmmaker friends as possible, or least the ones who give great critical feedback. You’ve already asked them but there might be something which they point out which nobody has before, so it’s worth doing one last check. Make any last minute tweaks if the feedback requires it, then hit EXPORT. After this comes the hard part: convincing people to watch your movie! “Sound effect” is a broad term. You’ve got hard sounds like gunshots, foley sounds like footsteps and clothing, and background sounds like wind and city streets. And finally we have sound design elements. These are sounds that tend to be used to aid the edit and give plot points added drama. Today we are showing you how using sound design elements can give your film extra impact and a smooth but pacey edit. We’ll be using our film The Asylum Groove as a reference, so if you haven’t seen it yet, there will be a card in the corner and a link in the description. In this scene, our character Sam is about to pour water over his head which causes him to wake up from his daydream and suddenly slip into a nightmare. In its current state, the scene feels lacklustre. This moment is supposed to aggressively transport our character from his happy place to a dark place and invoke a strange mix of false realities, so we can start to layer up some sounds which will get us there. Firstly, let's grab a punchy sound, and add it onto the cut mark. If we place this on the cut mark, it should give us that instant BANG which we need. Okay, this is getting us somewhere! But there are a few missing elements. At the moment, the sound is sudden, and it almost feels like it's trying to be this cheap jump scare. So we need to include some suspense. We can add a sound element which will hint to the audience that something dark and mysterious is about the happen. We need to add a crescendo, which is a sound which rises in volume or intensity. We can create a crescendo from our existing impact sound. If we duplicate the that sound, then reverse it, it transforms from an impact into a slow rising crescendo with a strong punchy tail. This is a lot closer to our final desired product. Now all we need to do is find a few more sounds which we can use for layering and add them in. To help give the moment even more impact, I have added a few more sounds. Firstly, I layered in a low rumbling impact. This is similar to the first one but has more low end for a crunchy bass tone. And to compliment the first crescendo, I used a hissing impact sound which I reversed. And I also added a very short-attacking high frequency sound; a mouth click, recorded in a large room with lots of reverb. This sound is supposed to represent the exact moment of change for the character. To me, it feels like when a magician snaps their fingers and puts someone under a spell, for our character, he is snapping out of it. The only thing left is adding the music and manipulating it, and we have the finished scene. You can find some great sound design elements online: checking out websites like freesound, sonniss, and 99sounds. Look for free samples, get them downloaded, and experiment. Foley Art is the process of recording everyday and run of the mill sounds and adding them BACK into the film. You may think Foley is just recording everything you see in the film and trying to sync it all up. Well...it is, but it CAN be a very creative storytelling tool with a technique called LAYERING. Without Foley, a film will feel unnaturally quiet. If there was one element of sound design you NEED in your film, it’s foley. It’s definitely worth the time and effort and will get you closer to achieving the film look. First of all, you have sounds which are low frequency: bassy, rumbly, dark sounds. Then you have mid-frequency sounds; clear, audible, and comfortable for the most part. And finally you have high-frequency; squeaky, buzzy, and sharp. The idea of layering is to fill out the soundspace by choosing some high, mid, and low frequency sound effects and place them on top of each other. This will give the sound effect a richer tone and extra punch. We have a moment in the film where our character Sam, played by Chris, runs, kicks a bucket, trips over, and hits the ground with a thud. When we filmed this scene, Chris jumped and landed on a pile of cushions, so we are actually starting from scratch. We are going to scrap all the production audio, other than the grunt from Chris, and build it up from scratch, starting with the impact with the bucket, then the impact with the floor. The first thing we want to do is add a bassy impact sound. We recorded hitting a cushion with a broom handle in the location. This sound will give the impact some weight and intensity because of the low-frequency thud and the long echoey decay. Next we need a mid-frequency sound. We recorded myself jumping onto a cushion. Originally I thought this would provide a bassy sound from hitting the cushion but the noise is actually coming from my boots hitting the floorboards. In sound design there are no mistakes, only new discoveries! And the last thing we need to complement the low and mid frequency sounds is a high-frequency sound! As the bucket is a metal, hollow container, it will provide us with a tinny, high pitched sound effect. So we recorded picking up and handling the bucket. One sound effect which will really bring the shot home is adding some sound for the post-impact. This will change depending on the shot you are working on, but for this shot, we used a sound of the bucket being kicked and rolling along the floor. This is very likely the first sound effect you’ll record if you want a “bucket kicking” sound effect. But layering them together definitely gives the impact more cinematic punch! And this is good proof that using the obvious first choice isn’t always the best! Once we fill in the scene with more sound effects, it really starts to give this shot life. With some simple layering, we have given this scene emphasise. It’s an important part of the plot and character development, so giving it some extra OOMPH helps tell a better story. When layering, try not to add too many sound effects of a similar frequency because you will start to muddy the audio and won’t be able to recognise each sound. And remember, you don’t ALWAYS have to fill the sound space. Sometimes two or even one sound element will do the trick. Sound design is all about experimenting, so try things out and see what works. 🎵 http://bit.ly/tflpb-mrboogeyman - Click here to download this episode's track. Check out Premiumbeat.com to discover a huge range of exclusive royalty free music! Now the Indie Film Sound Guide is over we wanted to share our thoughts about what went well, and how we messed up. The Indie Film Sound Guide is a step by step series teaching you all of the basics to achieve better audio for your films. This includes preparation, recording, and mixing. The guide uses a scene shot specifically for the guide, and follows a proper workflow from start to finish. This is everything you will need to know to start recording great sound for your short film! Anything we didn't cover? Leave us a comment and we'll create a wrap up episode at the end of the guide, answering any questions we missed! More tips in the video. 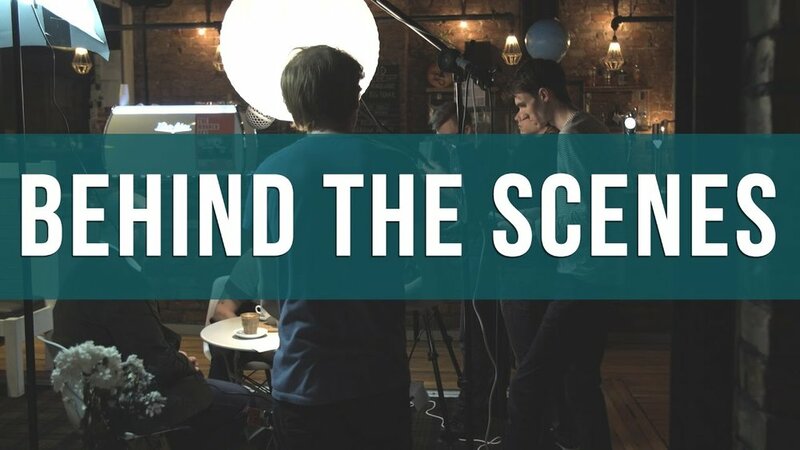 The Indie Film Sound Guide is a step by step series teaching you the basics of recording sound on set. In this video we talk about what you have to do next once you have finished editing your film and you have a picture lock. This is when you start to make the sound of your film sound just as good as the look of your film. We are by separating each actors dialogue with in Adobe Audition, and set there level between -6dB and -24dB. Adding room tone will help to fill in any silence between dialogue. Adding foley and sound effects is all done in the mixing process, so once you have re-recorded cups being put down, doors opening and footsteps you can add these into your edit. So you’ve finished shooting your film. You have a bunch of cards you need to unload onto the computer which contain the picture and sound elements for your movie. But before we start editing the footage and mixing the sound, let’s get all these files into a clear and precise structure, and synchronise the production audio to the shots. Editing and mixing without a proper folder structure is an absolute nightmare. Files get saved in the wrong place, shots go missing, footage can’t get re-linked, and it just becomes a fighting battle. It can get even worse if you’re working with multiple post production artists, all sharing the same files and muddling everything up when you bring it all back together. To help alleviate some of that stress, I’ll show you the folder structure we like to use here at The Film Look, and I’ll also show you a handy application to create the structure in an instant! Get yourself over to digitalrebellion.com and download their programme called Post Haste. It’s a free desktop app for managing projects, and has some great features. Once you’ve got it downloaded, you’ll see this screen. They already have some awesome templates for a range of creative workflows, but we are going to design one from scratch specifically for organising short films for use with multiple artists, and hopefully prevent any unlinked and dodgy files in the future! Let’s start off with the film’s root file, where absolutely everything for the film will be located. In order to keep files from going missing you must save everything used for the film inside this folder, even if that means duplicating some assets from graphics libraries, for example. Keeping it all inside this folder means you can move the hard drive to another computer, open it up, and everything you need is already in the correct place. Inside here we have project folders where all of the session save files will go. Inside these folders will be one for dragging old versions of save files to keep it tidy. Next we have a media file. This is where all of the video and audio files will be transferred to, as well as any photos, graphical assets, and music used in the film. Inside the video folder we have folders separated by each of the shooting dates. Inside the dated folders, transfer everything from each card you have into their own folders. This means copying all of the system files as well as the video and audio files. This is to ensure if anything goes wrong, you have the full image of the SD card if you need to transfer anything back over to the camera. Fingers crossed you never have to do this! Having dates on the folders means you will know exactly what you shot on that day, and you are able to link the video dated folders with the audio dated folders. The audio folder is similar to the video folder; everything is firstly dated then the whole card image is copied and pasted into their own audio folder. Then there is a production documents folder for scripts, storyboards, shot lists and other documents like forms, permits, and contact information documents. The last main folder in the structure is the export folder. Inside here is a folder for the film and scenes, and another for rendering out VFX sequences. So now we have a folder structure, let’s make a bin structure inside your editor! We are using Adobe Premiere for our projects; if you are too, you can find our Premiere Template in the description below. If you’re using something else, follow along and you can create and customise it to suit you! First of all we will create a sequences bin; this is where you can save your main timeline, any duplicates if you want to save versions, and maybe even something like a selects sequence. Then we have an assets bin, which will hold all of the global music and graphical assets for the film. Next is a media bin. Inside here will be a bin for the shooting date, inside here will be a bin for the video and audio, and an extra bin called Synced A\V. When you have your footage imported and inside the correct dated folders, we will start to rename clips, synchronise the video and audio, and place them into the Synced A/V bins. Go through each video clip and rename them to the mark written on the clapperboard at the start or end of the take. The audio will have an audible take with the same numbers and letters called out. Some shots may have no audio to sync. And if you have recorded any wild takes, rename these according to the mark you can hear at the start of the take. To synchronise and merge the audio and video takes, first of all double click on the video file to bring it into the source window. By clicking on the audio icon, it will display the waveform. Scrub along to the audio spike and bring the in-point right up the start of the spike. You can set an in-point by scrubbing to the point and hitting “I” on your keyboard. Okay, half way there. Find the production audio of the same take, double click on it to bring it into the source window, and set the in-point just like the video file by hitting “I”. Now that we have the in-points selected on both clips, hold control and click on both the video and audio files. Right click and go to Merge Clips, set the Synchronise Point to In Points, and check the box next to Remove Audio from AV clip. Checking this will get rid of the scratch audio and just use the good production audio. If you want both, uncheck this box. Then place the newly merged file into the Synced A\V folder. Do this with all of the files, and you will have synchronised audio for your scene. Now it’s time to edit! Foley art is the reproduction of everyday sound effects that we are going to mix back into the film. For the scene we are using, these are things like clothing movement, Frank tapping on the table, coffee cups and saucers clattering, and hats coming on and off. Without these sound effects, your film will lack a rich cinematic soundscape. It will feel unnaturally quiet and uncomfortable. Foley Art is what separates the men from the boys and women from the girls, and mixing Foley into your film is another step to creating the film look. If you have been following this guide from the start, you have probably already recorded a bunch of wild takes for your scene. A lot of these will work great. But if there are any which don’t quite sound right, you can always add those elements to the list of sounds you can re-record as Foley. So how do we go about recording Foley? Find yourself a quiet room. A small room, preferably with carpets will work best. Hanging up any blankets and clothes to cover up walls will dampen any reverb you might get from the sound bouncing around the room. Next you’ll need props and materials. In order to record the sound effects, use any objects which will create the noises you need. With the materials gathered it’s time to imitate the actions in the scene to re-create the sound effects. As a visual aid, you can export the edit of the scene and put it on a laptop or a phone. Playback the scene and do what the actors do. Do this with all of the actions you can think of, several times. Like when recording wild takes, mark the track by yelling out what action it is you are re-producing. That way in the mix, you’ll know exactly what the sound is supposed to be. Get the microphone as close as you can, and try to keep the gain lower than what you set it during the shoot. You will want to record the Foley very clean and with low noise. The sounds may be quieter than dialogue, and it might not hit really loud levels, but don’t worry. Just as long as the recording isn’t noisy and you have the microphone nice and close, this will work just fine. After recording Foley, you should have everything you need to create a rich cinematic soundscape for your scene. You might have to source some sound effects online, but if you can re-produce them yourself, it’s always the better option. Let’s talk a bit about recording sound effects for your film. In particular, wild takes! So far I talked about positioning, getting clean dialog, removing unwanted noises, and where to set your levels. Now comes the next thing on the list: recording wild takes! Wild takes are the process of recording sound on location without the cameras rolling. This means you can get a lot closer to certain things and record crisp, clear sound effects. We will go through recording sound effects later on in post-production known as Foley Art, but right now, we are going to grab as many sound effects as we can here on set. There might be some sound effects which are very difficult to re-produce, such as the sound of machinery, locks, doors, and footsteps on particular surfaces. Grabbing these sounds on location means you won’t have to go trawling the internet for the perfect door latch sound effect! We will record furniture, clothing, tapping, and cups and glasses later on as they are a lot easier to get right in post, and it will save time on set. So, record your wild takes at, or lower than, your scene’s gain cap. If the sound you are recording is quiet even at the gain cap, don’t worry! You don’t need to rack your gain right up to record it loud, because it’s likely going to be mixed quietly in the edit anyway. You will want to record at least five or six takes of each sound effect, all from different angles, positions, distances, and even direct and non-direct recording. Having more to choose from later on will help a lot when mixing. Something recorded at a different angle can sound quite a bit different, and sometimes it sounds a lot more realistic and cinematic too. So make sure to record a range of each sound effect so you can choose the best later on. When you start recording, mark the take by clearly stating what action is being performed, and if it’s from a different angle, state that too. In editing, you will be able to listen to the start of the audio and know exactly what it is. So now you should have: a well-positioned microphone recording clear and loud dialog, you should have eliminated any unwanted noises and sound effects during the dialog takes, a gain cap with room tone, and a library of sound effects to layer into the scene. Most audio devices will have a way of manually choosing how sensitive your microphone is to sound. But where do you set your levels? So far we have talked about getting in the right position, recording clean dialog takes, and removing any unwanted noises from your scene. If you want to catch up, episodes 1-3 are in the description. Let’s talk about where you should be setting your sound levels. The loudness of actors and their actions differ from scene to scene, and even take to take. So what I like to do is run through the scene with the director and the actors, sound kit at the ready, and study the sound levels. Set your levels so you are getting loud and clear dialogue with a little bit of room from the top peak line just encase the sound gets a little louder. If you are risking your sound clipping during the dialog, your gain is probably set just a tad too high. Once you find a comfortable loud and clear level, you shouldn’t have to adjust the gain above this for the rest of the scene. Make a mental note of the number your audio recorder is reading out – this is your scene’s gain cap. Going above this will only introduce more noise with no real benefit. If an actor shouts in the scene, such as this example of Stu, your microphone will very likely be overdriven and the audio will distort. This is known as clipping. Clipping your audio is just as frowned upon as overexposing your footage. You aren’t only recording something that sounds bad, but the information is now destroyed and can’t be recovered. No amount of tweaking will fix the distortion. The solution to this is to lower the gain until you can record the shouting without it clipping. Because you’ve brought the gain down in order not to clip the audio, it will have also lessened the amount of natural noise compared to the other takes which are set higher. So we will need to add that natural noise back in. You can do this using room tone. Room tone is a recording of up to 2 minutes of nothing but complete room ambience, recorded at your scene’s gain cap. Room tone is there to fill in any patches of silence when editing dialogue and sound effects. It is also used like a Band-Aid, to cover up any unwanted noises or if the director gives direction mid-take. A good time to record your room tone is at the start of the shoot, just after you have found a good gain cap. Recording it before you start rolling picture helps in a few other ways too. Firstly, you won’t forget it as its top of the list. Second, you aren’t making people wait around at the end of the day to capture it. And third, if there are any more unwanted noises you didn’t pick up on, you will likely hear them when you record it. So, step four, set your gain cap and don’t go beyond it. Either lower the gain or move your microphone away if it clips. And don’t forget to record room tone! As the sound recordist, you have the power of the microphone and headphones. If you can hear any unwanted noise, such as the air conditioning unit, a clock ticking, or a plane flying overhead, you need to speak up and get it shut off. Welcome to episode 3. So far we have talked about the best position to record and prioritising dialog. Now it’s time to talk about reducing unwanted noises for really clean and crisp audio. Unwanted noises are a pain to remove in post-production. You want to record in the quietest possible environment, so turn off any whirring computers, buzzing fridges, and silence anything which hums, buzzes, or beeps. Once this is done, you will have a nice quiet location to record in. But it doesn’t stop there! Sometimes in a scene an actor will be performing an action while delivering a line. If the action creates a very loud sound mid-dialog, you’ll want to minimise the loudness of the action as best you can. Here we have a scene: Stu and Frank are discussing how they are going to dispose of a body, and Stu goes to take a drink. This is where the issue occurs. Stu speaks at the same time he places the cup down onto the saucer. This means we now have 2 sounds baked into one audio track; the dialog of Stu and the coffee cup sound effect. There are 2 ways we can deal with this. Firstly, we can change the blocking. If the timing can be changed so Stu delivers the line THEN places it down, problem solved. But sometimes this slows down the pace of the scene. So instead, we can try to minimise the sound of the cup and saucer colliding. If the teacup and saucer aren’t in the shot when it is being placed down, you can remove the saucer completely and cushion the contact between the table and the teacup using something like a towel or a sweater. Then it’s a case of recording the sound effect of the cup and saucer and mixing it back into the scene. With all of your sound elements as independent single tracks you are able to alter those sound effects without affecting any of the others. If your sound elements were on a single track grouped together, you won’t be able to change one sound without changing all the others. It’s like trying to unbake a cake. This goes for dialogue too. In production, try prevent any overlap of dialogue between actors. You can always edit overlap of lines in post-production. So step three, remove any buzzing and humming from the scene, and limit the loudness of sound effects by dampening or removing them all together. There’s a lot of sound going on during a shoot. You might be wondering what you should be recording first. Welcome to episode two. So far we have talked about positioning your microphone to get the best results. Now it’s time to talk about WHAT you should be recording. If it’s a narrative film you’re making, I imagine it will have some sort of dialog. This is your highest priority. Don’t worry about recording footsteps, pats on the back, coffee cups clinking, or any other sound effects just yet. All of these sound effects are a lot easier to reproduce. But if you don’t get your dialogue, you’ll spend a lot of time trying to either fix it in post or dubbing it back in. Right now, as the sound recordist, you just need to make sure you are getting clean dialog takes. If your audio is compromised before action is called, such as buses going past, or rowdy pedestrians outside, make the crew aware and you can wait it out, these things usually only last a few minutes at most. In the meantime, the rest of the team can record some reaction shots, inserts, or anything else which doesn’t require audio being recorded. If the sound is compromised during a take, however, it’s a good courtesy to continue rolling. A short interference of sound can be edited out just as long as you have a few cleaner takes to work with. I will talk about this more in a later episode about mixing. When recording dialogue, it is essential to mark the take and record a clap using a clapperboard or your hands. A clap will generate a spike in the waveform so you can use it as a pin point to synchronise your good audio to your camera’s scratch audio. If you are recording your audio straight into the camera, it isn’t as necessary, but it is a good habit to have anyway. If you forget to mark the start of the take or the board wasn’t visible in the shot, you can always mark it at the very end, known as second sticks. If you notice the take wasn’t marked with a clap, make everyone aware before the director yells cut. 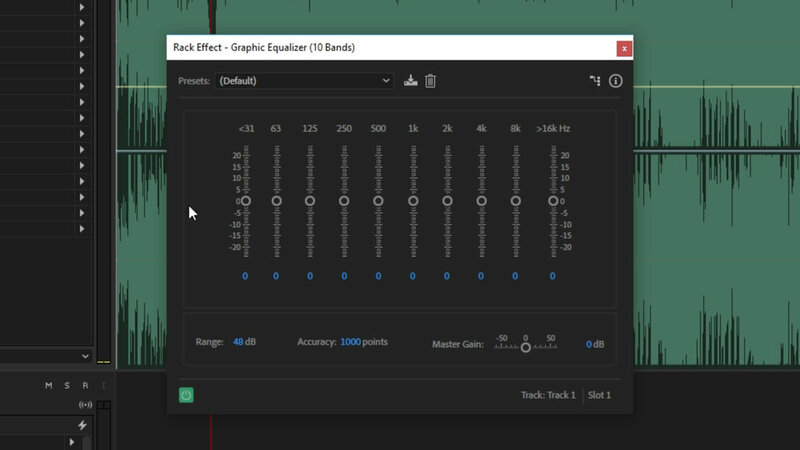 Syncing audio which doesn’t have an audio spike is a pain to mix. Speaking of the director yelling cut! The camera operator and sound recordist should only cut picture and sound when the official call has been made. When you start making films, this is a habit you might have to force yourself to break. If the director wants to continue rolling, and you cut sound, the shot will have to be marked again, slowing down production. So just keep rolling until they say cut! So step two. Your priority is good, clean, loud dialogue!